Listed below is the equipment that I use to document paranormal investigations, or ghost hunting as most people call it. This was my first piece of paranormal equipment [well that is equipment I purchased specifically for paranormal research], your cell phone can be considered a research tool if used for pictures or capturing EVPs. What it does is scan through the radio stations – either forward or backward. Like manually turning a radio dial all the way clockwise or all the way counter clockwise at a rate or speed, that rate is called the sweep and for the P-SB7 it ranges from 100ms-350ms with white noise mixed in as each station moves up or down the dial. So at 100ms [the fastest sweep on the P-SB7], it will sweep or scan through 10 radio stations per second. You can sweep through the stations forward or reverse, either in AM or FM. Spirits supposedly can manipulate the frequencies of the radio stations and/or have the energy of their voices carry on the frequencies of the radio stations during sweep – there are several theories on this. Everybody has their own way of using the spirit box and there really is no right or wrong way to use it – Some prefer to use faster sweeps and some like the slower sweeps. I have removed my antenna and coil from my spirit box – this cut down on radio stations being picked up, but to cut the stations out entirely you can use a Faraday cage to block pretty much all of the radio reception, but only the strongest spirit responses would come through. Some people believe they get more results from having better reception, and more spirit responses and believe it may be easier for a spirit to use the incoming frequencies better if stations are picking up stronger signals. I use this more then P-SB7. It is two spirit boxes in one – that is you can use both spirit boxes at the same time, or just one. You have the option of sweeping both boxes in FM and/or AM and forward and/or backward at the same time. It also has a nice feature to turn off the antenna and the coil for AM, FM or both with a multi select slide switch [This is what I did to the P-SB7 with removing the coil and antenna – the the P-SB7 picks up more stations the the P-SB11 with the coil/antenna disconnected]. It has a temperature monitor and a mute button [I prefer to use my hand to muffle the speaker]. Only regrets, not spending an extra $20 more at the time they had them with the REM feature built in. How can they have included REM Pod circuitry for such a cheap price? Considering a REM Pod in it’s big PVC pipe large holding case – Can cost up to hundreds of dollars. The P-SB11 can go all the way down to 50ms sweep speed in AM or FM, or both simultaneously – On faster sweeps the spirit voice would have to be spread over several radio stations, and at 50ms – you are scanning through twenty radio stations every second! So fast you will not hear a radio bit, or snippet – but if words or phrases can be heard then that is something amazing. I think the real slow sweep can increase the chances of Pareidolia, do to the length of time a radio bit can be heard. I prefer to do faster sweeps and sometimes I will slow the sweep down a bit if little to no radio is being received but overall I prefer NO radio stations being received. The Mel-Meter is an EMF and temperature monitor that will measure EMF in the range of about 30hz-300hz. It will also record the highest and lowest EMF and temperature readings until it is turned off. The KII is very sensitive and detects EMF in the ranges of about 50hz-20,000hz. They can alert you to possible anomalous activity – but that anomalous activity could be from being near any electrical devices or motors, bad wiring, sometimes just being in the same room and not near the actual wires, some types of lighting and/or ballasts from the lighting, or even a cell phone trying to ping a tower [which should be in airplane mode to eliminate that. In environments like an old buildings with really bad wiring, the EMF interference from the wires will probably negate most if not all KII spikes, it would be nearly impossible to determine if bad wiring, or other electrical contamination or a spirit – so in some situations the KII is useless – The Mel-Meter is not affected like the KII is in this situation, nominal detection for the Mel-Meter can go up to 0.5 Milligauss. Another Mel-Meter but this time with a REM, a Radiating EM field and an ATDD – an ambient temperature deviation device – if enabled, the ATDD will monitor the temperature and alert you if it raises or drops depending of how it is set. It had warmer and cooler indicator LEDS and an audible alarm if enabled. The REM function creates an EM field around the antenna, and anything that conducts electricity that disturbs the EM field around the antenna will sound an alarm and LEDs across the front will illuminate according to how much the field is disturbed. The more LEDS that are lit up, the higher the audible tone. It has 5 levels of sensitivity and a manual/auto baseline feature – if it is sat near something that sets it off, you can press the baseline button and it will now ignore that object and still detect normally. The REM pod can be set off by walkie talkie frequencies. Not sure if any cell phone signals or other devices can interfere with it. This device has a few features to it. What people use it for most is the dictionary mode. Basically it converts energy in the environment to words, that are pulled from a database. In theory, the spirit can manipulate the energy to choose different words. Among other features are a touch device, that if something gets near it it will make a ping sound [I could never get this feature to work for me correctly] and the ping sound is annoying. The next features are a Q&A mode, and a phonetic mode where it only gives the phonemes of speech – the small parts of sounds that make up different words. It also includes a thermal flashlight, where the LEDs can turn from blue to green, to red depending on the temperature of what the hotness or coolness of the object it points at. An energy scope – that gives a pixelated display of the environment energy so you can detect any fluctuations or for ITC. A draw mode that uses the environment energy to draw something on the screen, another ITC method. And a white noise mode. I will use the Ovilus III sparingly now, the voice is hard to understand and you mostly have to look at the display and then repeat what it says so the other investigators can understand it. One recorder would work, but I like having two. I use two Olympus vn-721PC digital recorders. I like having the same make and model for ease of use and record in 64Kbs. For some people they prefer the lower quality recordings – To me the lower quality ones sound garbled, and will use audio software only if absolutely necessary. The two Olympus digital recorders I use are moderately priced. There are digital recorder will all sorts of features and price ranges. Some go for over $300 – And yes they are very, very sensitive and will be able to pick the faintest sound. Sometimes they can be too sensitive and picky up too much. I have two of the same for ease of use. What may be better is the real time EVP recorders [they will play what they record – you hear the EVP real time] – you can also insert a headphone jack in the speaker while you record and may work similar. This is my favorite piece of equipment. I use two modified Sony CX-240’s. Modified by removing the hot mirror – which is either clear plastic or glass with a coating on one side to block some of the infrared light and another coating on the other side to block some of the ultraviolet light. With no hot mirror, the camcorder will see visible light, IR or infrared, and some UV or ultraviolet light. Only some ultraviolet actually makes it to the light sensor because the glass that makes up the lenses and the coatings on the lenses, blocks some UV – although some still gets in and makes it to the light sensor. I always record the entire investigation, since I am recording video as well as audio. Too bad the Cx240 does not have an external mic or headphone. I use a regular GoPro for taking pics of the locations outside and sometimes inside if there is cool or unique stuff inside. The full spectrum GoPro I use for taking photos in what is called burst mode – I have it set to take five pictures in about 1 second by pressing the photo button once. For pictures relating to the paranormal I always take multiple pictures of each shot, and several pictures. You can take one picture of this, or a picture of that – but with light artifacts from reflection, matrixing, moisture, dust, etc., I prefer to take several pictures of each scene to be able to have pictures for comparison against the anomalous photo in question instead of having only one picture with something that appears to be anomalous on it. I created my own IR lighting, which was not difficult – but does become a bit difficult if you need higher power requirements which pump the voltage up to higher than what the battery voltage is, or have to include transistors or IC chips. A lot IR lights you can buy are basically a few LEDs wired together with at least one resistor, a switch, and a hot shoe [to attach to cameras, camcorders, or light mounts] and are usually highly overpriced. I had some credits on a website and used them towards a 2 LED IR light that retailed for about $24. Took it apart… It only had 2 LEDs, 1 resistor, and an on/off button, but it costs $24! I use 1-chip and 3-chip 850nm 10mm IR LEDs. The 1-chip has 1-chip that emits light, where the 3-chip obviously has 3 chips that emit light. The 3-chip LED light spreads like a floodlight, the 1-chip is more a spotlight. The 3-chip I use for small to large rooms and the 1-chip I use for hallways or for a spotlight – some designs I have both 1-chip and 3-chip together in one unit. The full spectrum lighting is basically IR light, UV light, and some visible light. The idea is to illuminate in full spectrum – Most full spectrum lights have usually have green [since it is in the center on the visible spectrum, but sometimes red and green, or red green and blue], IR [normally 850nm], UV [I use the 380nm]. I wanted lower down in the UV spectrum below 380nm but those are a litter harder to find and the glass in the camera’s lens blocks some UV. Just a laser pointer with an end that can be manually turned to produce patterns of light onto a wall or other flat surface. This is to detect if anything moves in front of the light. Only drawback is they are usually made with a momentary button, so a rubber band like ring [usually sometimes sold separately – of course] is used to keep the button pressed in. Unfortunately the one I received from an online ghost equipment store had issues from the start with the cheap momentary button, and it eventually broke and the laser pen was overpriced. I have not experimented much with the flashlight ITC, but pretty much all the people use the same technique – take a turn-on turn-off flashlight, slightly turn it until it turns on, then turn it slightly until it turns off. The flashlight will be off – that is until a spirit answers your questions by either turning the flashlight on for yes, or back off for no. But how do you tell if it is a spirit manipulating the flashlight or if the flashlight randomly turning off and on due to randomness, or temperature changes (Causing contact points to touch, possibly heat up then loose contact causing the flashlight to turn off). The one thing to note is the with the twist-type flashlights – there is no exact positioning, or degree to turn the flashlight off – so each time an ITC session is conducted – the flashlight will be off but at slightly different degrees in the turn each time you do a session – Maybe a marking i s needed to make a default off position, so that way every ITC session, the flashlight is turned off to the exact same point each time. There is another way to do flashlight ITC. And that is with the click-on click-off flashlights. Although I would avoid the cheap dollar store type that usually flicker, or go on or off under normal use (because they are made really cheaply). A half decent click-on flashlight would be appropriate – The only person I know who does click-on click-off flashlight ITC is Pamela Vanderpool – and I have seen great results during her ITC session at Preston Castle, in Ione California. 1.) Cannon AX-20 professional camcorder (visible light/IR mode – not sure with this camera if it is possible to make a visible/full spectrum mode). I contacted Cannon but I could not get an answer on the internal workings of the mechanism that switches it to night vision mode. I would have to see the technical manual. 2.) 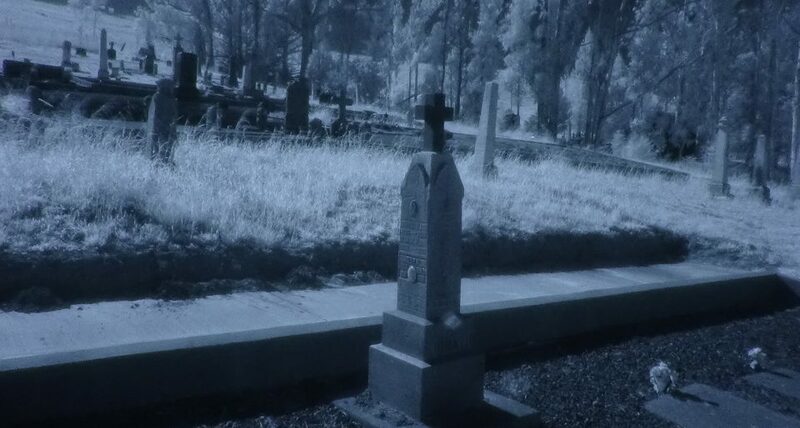 Thermal Cam – For monitoring or detecting cold/hot spots, with temperature. 3.) SLS Camera – Structured light sensor camera. Apps, smoke ITC, TV feedback and water ITC, other spirit boxes [there are many] – I have not used these methods enough to make a decision but the little experience I have with some of the apps that I have heard usually are annoying to me – Like the echo box and similar items that I cannot tell if it is spirit communication or random voices/noises mistaken as responses due to one’s own pareidolia. I could not take any words or phrases from an app and consider them validation even though in theory spirits can manipulate electronic devices – it would help if the response was backed up by an EVP or light anomaly or temp spike, etc. There are many devices, with many different functions and everyone has, or will find their own preferences and equipment they favor.